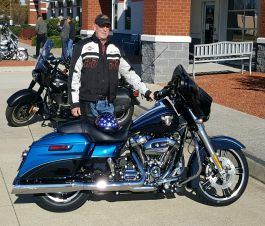 I recently completed the purchase of my second Street Glide from Colonial H-D. I could not be happier with the entire buying purchase. I saw the bike, thought about it for a few hours called Rob Blair telling him to mark it sold and it was mine. The service department did an excellent job handling all the upgrades. And finally Tommy Thompson did a great job making the paperwork transactions a breeze. Thanks to all a Colonial H-D! They really do treat you like family! !